I may tire of them one day, but the weekly Dollar Tree visits have definitely become a tradition in my family. My aunt and I went to one on Saturday, and this time my sister was with us (and serving as driver!). As we stood at the register with our hands full, my sister said, "I wasn't actually planning on buying anything in here …" and she ended up finding even more goodies than I did. My purchases, as so often happens, had a theme. First, I found the notepads Susan K. had told me about recently. (Thanks, Susan!) I bought all they had, which was only three, and I'm thinking some tea-loving friends will be getting the extras as stocking stuffers this Christmas. 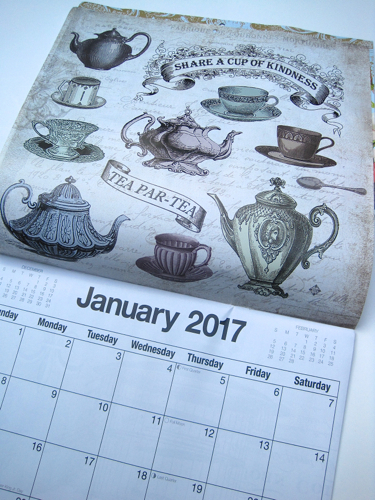 And this paper may be a little flimsy, but considering the price, I was delighted to find this calendar with vintage handwriting on it, especially the page for January 2017. 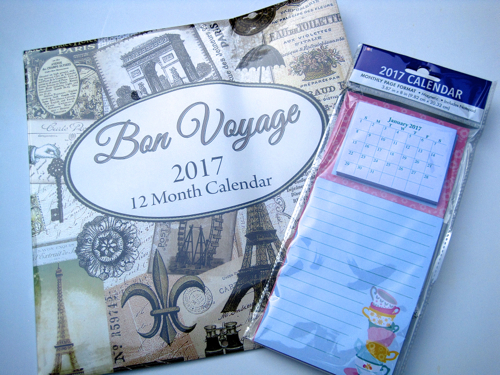 I can see some crafts in this calendar's future! 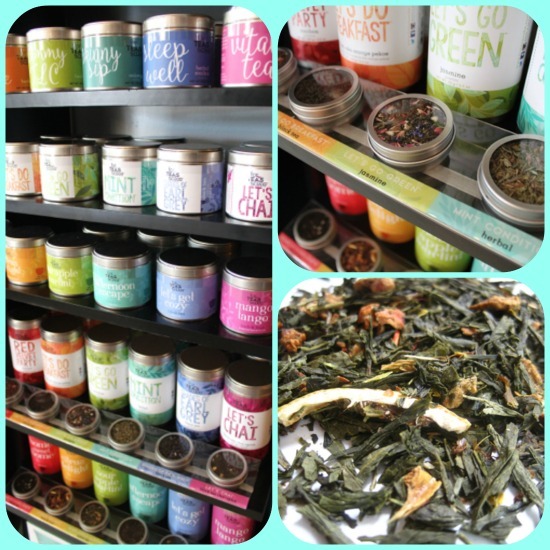 Some of you may recall that a couple of weeks ago, I blogged about my new friends at Plumyumi Day Spa in Peachtree City beginning to offer loose leaf teas. I got the nicest email from the owner, and since he's making a great offer to those of you who live nearby, I couldn't wait to share it here! I cannot express enough how much I appreciate your comments and reviews regarding our introduction of loose leaf tea here at Plumyumi Day Spa. The response from our clients has been extremely positive. This would not have been possible without your advice and encouragement as we started this endeavor. As a show of appreciation, I would like to extend an invitation to your readers to visit Plumyumi to sample our teas along with a complimentary cup of his or her choice. In fact, if they decide to purchase one of the large (2.5 to 3 oz) tins of tea, they will receive a small (1 to 1.5 oz) tin free with the mention of your blog. Thank you again Angela. I'm still enjoying the Sour Apple Martini tea I purchased at Plumyumi, and you can bet I'll be running back by there soon to take advantage of this generous offer myself. (Christmas is coming, and I need a tea gift for someone right now as well!) I did contact Eddy to ask him how long this offer will be available, and he said he'll be happy to honor it through the end of September. Happy sipping, y'all! • One category of tea photo I’ve discovered this year might be titled “Politicians’ Wives Taking Tea.” (Of course today that would be “Political Spouses Taking Tea,” but it was “wife” back in the day.) 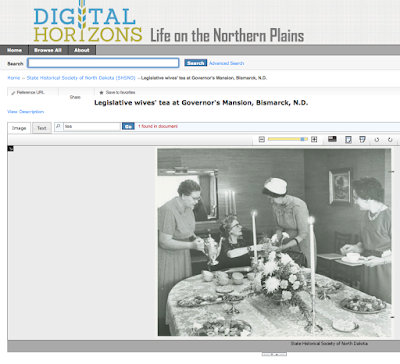 When I visited the photo archives of the State Historical Society of North Dakota, it led me here, to a photo titled “Legislative wives’ tea at Governor’s Mansion, Bismarck, N.D.” This was taken in 1963, and it’s fun to note the Queen Elizabeth—style pocketbook, the hat, and the vintage eyeglasses. The women are identified as "Mrs. Ole Breum, Mrs. Esther Wenstrom, Mrs. Walter Christenson, Mrs. Otto Hauf.” (Why is Esther the only one who’s not referred to by her husband’s name?) I just wish the photo were in color so I could tell what kind of teacups and treats those were! 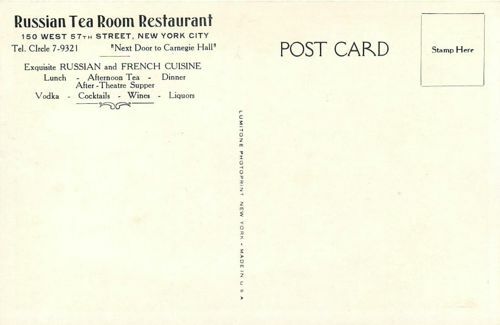 So I've found another interesting old menu on the New York Public Library's digital collections site. 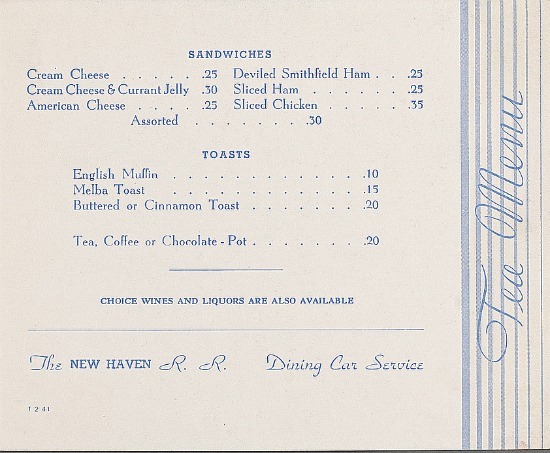 This one is a 1941 tea menu from the New Haven Rail Road. Look inside! 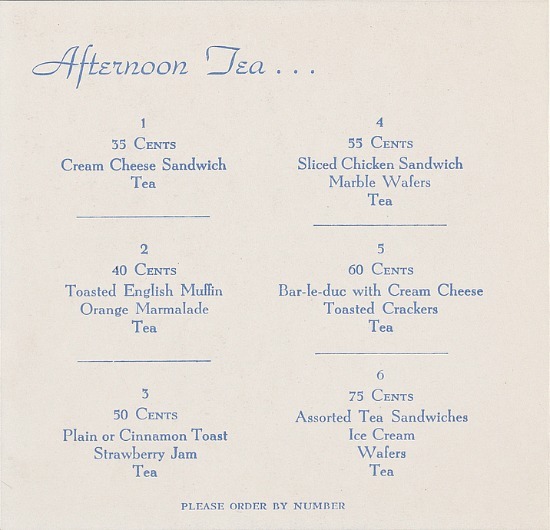 Have you ever seen a tea menu that asked you to "please order by number"? That's a first for me. I'll have the #6, thank you very much, and no fries with that. I believe that the "Bar-le-duc" in #5 refers to a type of currant jelly from France. It's always fun to look at these old menus, and it's especially fun to see a Tea Menu for Dining Car Service! And these! So now I'm rather spooked and don't use the teacup anymore. 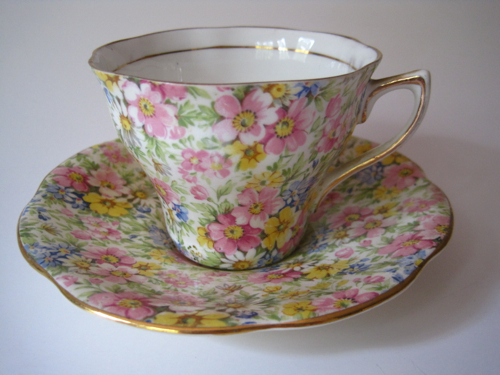 I've Googled and learned I shouldn't have used bleach, but the reasoning was only that bleach can damage the teacup, not that it could cause a stain. 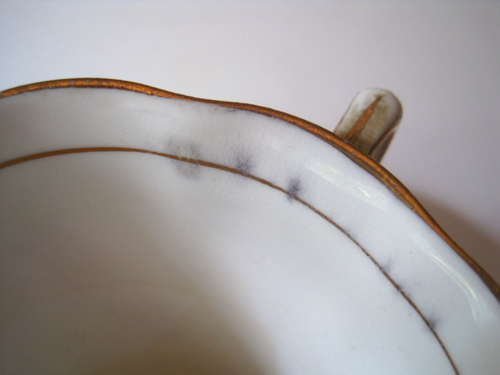 Now since chemistry was never my best subject in school, I'm wondering if any of you smart people might have an explanation for the black spots on my teacup. Anyone? 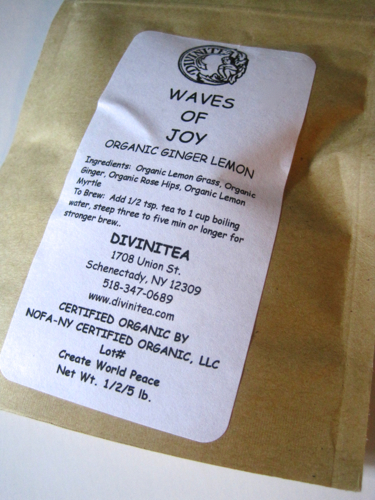 A friend recently shared with me this Waves of Joy tea from Divinitea. I loved the name, Waves of Joy, and that would have sold me on this tea without even knowing what was in it! But since I happen to love ginger and lemon flavors, I suspected this herbal tea would be one I'd enjoy. 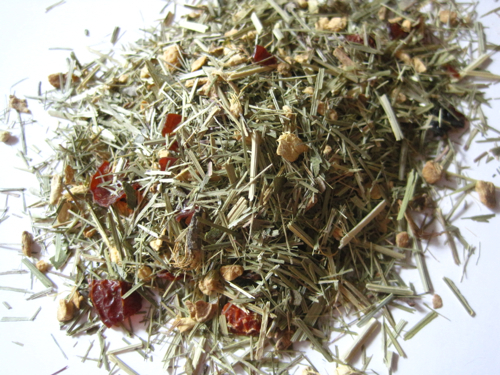 It includes organic lemon grass, organic ginger, organic rose hips, and organic lemon myrtle. I love being able to see all of these individual bits in the loose blend. And steeped, this tea had just the spicy ginger and lemon flavors I was hoping for. Ginger gets me in the mood for fall, yet the lemon is a lingering nod to the last days of summer. 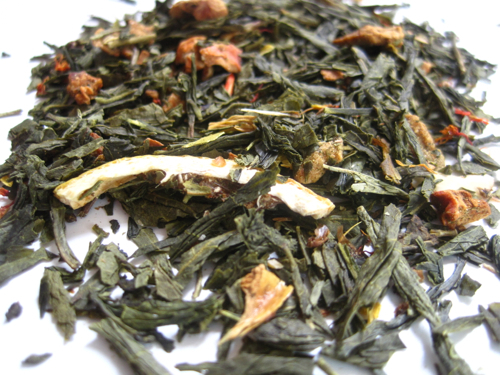 I very much enjoyed this tea, and if you'd like to check it out for yourself, click here. 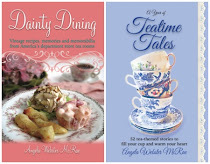 I will read almost any book with a teapot on the cover, and as I suspected, Wendy Sand Eckel's newest cozy mystery had plenty of tea-ish moments to keep us tea lovers happy! And although this was the second book in a series, I had no difficulty at all jumping right in with the storyline and understanding what was going on. 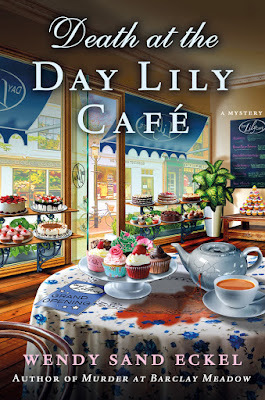 The recently divorced Rosalie Hart of Cardigan, Maryland, has just realized her dream of opening her own café when, shortly after the grand opening, her friend and fellow merchant Doris comes asking a favor: Doris's sister has been accused of killing her husband, and Doris wants Rosalie to help prove that the sister is innocent. This book has a rich and diverse ensemble cast I greatly enjoyed meeting, including Glenn, Rosalie's 72-year-old best friend and right-hand man; her other wait staff member, Crystal, the young "hippie" who makes teas and tinctures; frequent customer Janice, whose hot flashes inject a bit of humor that middle-aged readers will no doubt appreciate; hunky Tyler, who runs Rosalie's farm; Annie, Rosalie's college-age daughter; and Kevin and Jake, a gay couple who find the town surprisingly welcoming— with one notable exception. Doris's deceased brother-in-law is suspected of having stolen some money from the construction site where he'd worked, and it turns out that plenty of people had a reason for wanting him dead. Eckel keeps us guessing the killer's identity right up till the satisfying end, but best of all, she layers this cozy with some complex, messy, and thoroughly realistic lives that make this mystery a pleasure to read. A weekend of books, books, and more books! 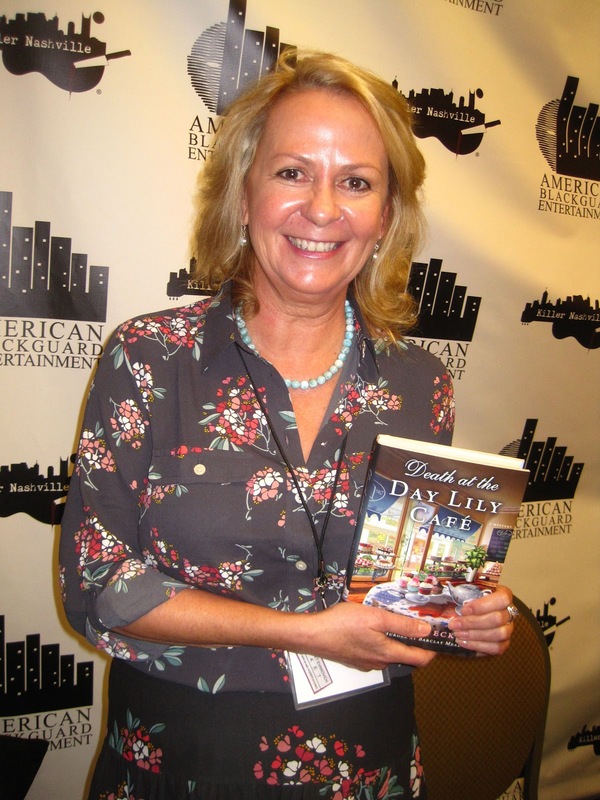 This week I was able to attend my first Killer Nashville, a well-known conference for mystery writers that is held each year in Franklin, Tennessee. 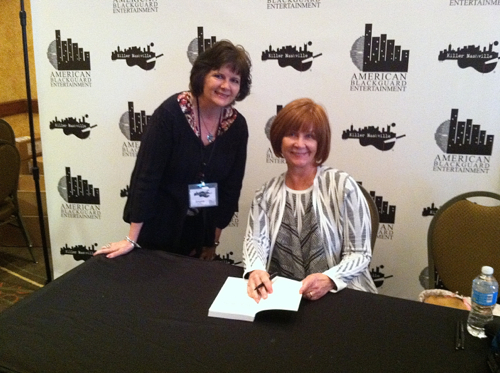 I got to meet so many wonderful writers and attend three days of educational sessions, including two sessions with the delightful Janet Evanovich, who graciously signed my copy of her book on writing, "How I Write." I'm about to read her new novel, "Curious Minds," which I've been hearing good things about! 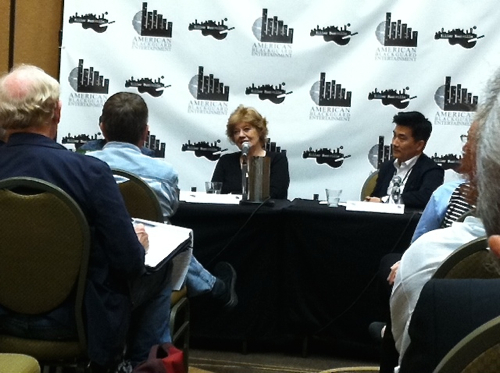 Anne Perry, the famous British writer of historical fiction, was on a panel I attended about using our fiction to promote social change. 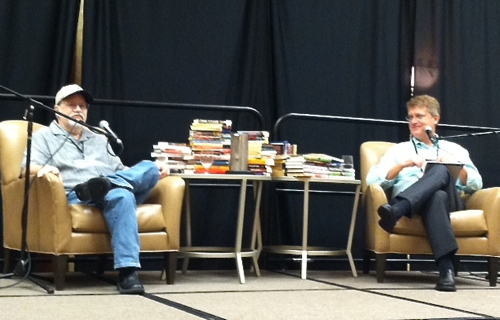 At right is novelist Paul H.B. Shin, and they gave me lots to think about! 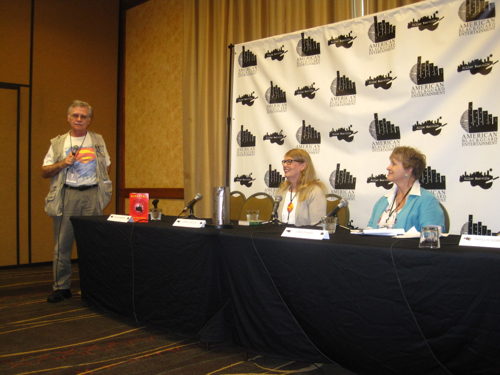 Since I'm polishing up the draft of my first cozy mystery, I was particularly interested in the cozy authors I came across, including Cheryl Hollon, center, who writes the "glass shop" cozy mystery series I've been hearing about, and another session (where my photos didn't turn out) featured Gail Oust, who writes the Spice Shop cozy mystery series I've also been hearing good things about. 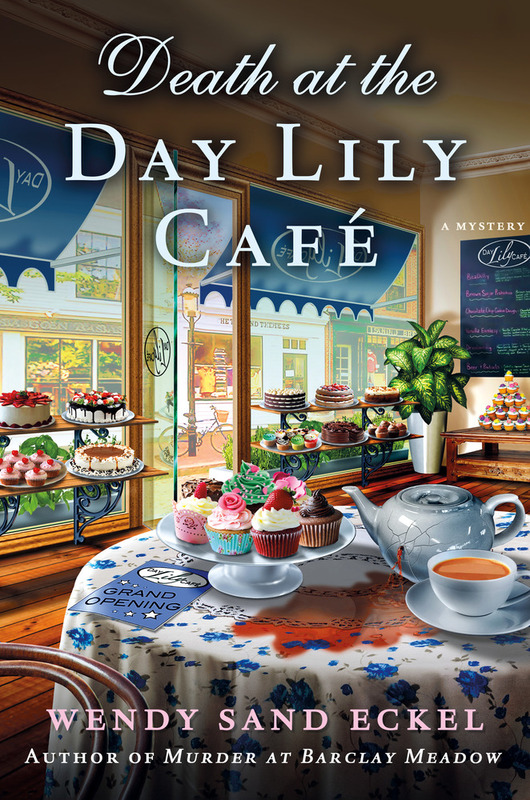 And since her book was already on my Kindle, I was delighted to arrive at the conference and discover that one of the panelists was Wendy Sand Eckel, whose "Death at the Day Lily Café" has a teapot on the cover! I liked her panel and what she had to say about her book so much, I immediately started reading it on the way home (Alex was driving), and tomorrow I'll have a review. I must say that after so many days talking about books, books, and more books, I feel as though I am living the famous Louisa May Alcott quote: "She is too fond of books, and it has turned her brain"! North Carolina is a state I have grown to love for a number of reasons. My tea friend Ginger lives there, my favorite statewide magazine is based there (Our State North Carolina), and not insignificantly, the awesome publishing company I edit for, Red Adept, is based there. And happily, I know that some pretty unique tea news comes out of North Carolina! • This vintage postcard depicts a teapot that marks the site of the famous Edenton Tea Party in Edenton, N.C. Some courageous women led by a Penelope Barker vowed they would no longer “conform to ye pernicious Custom of Drinking Tea.” Some 51 women met on October 25, 1774 to protest the Tea Act passed by the British Parliament in 1773. 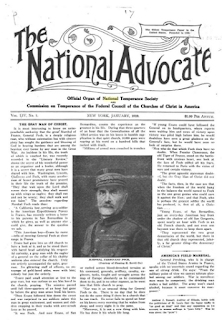 They signed a petition vowing that they would give up their tea and boycott other British products "until such time that all acts which tend to enslave our Native country shall be repealed." • Camellia Forest Nursery in Chapel Hill, N.C. is a well-known nursery that grows and sells tea plants. A friend and former blogger in North Carolina actually gave me my own thriving camellia sinensis plant, and if I ever need another, one of the first places I will turn will be Camellia Forest Nursery. You can go here to learn more about the varieties of tea plant they sell. 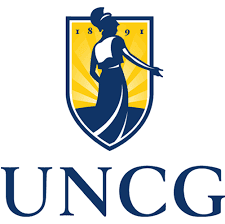 • The University of North Carolina at Greensboro has spearheaded a tea mapping project showing the locations of tea plantations in the U.S. The U.S. League of Tea Growers wrote about the project here. With tea being grown all over the U.S. these days, I think it's a great idea to map all of the tea-growing areas of the country, and I look forward to hearing more about this project in the years to come! 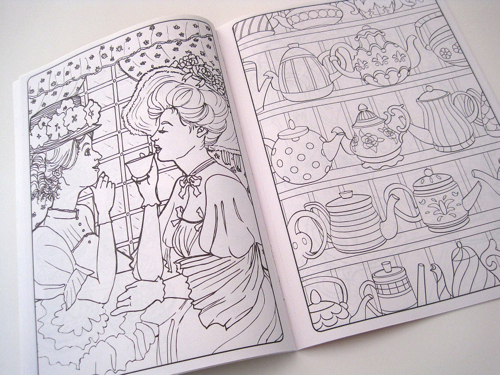 One more coloring book giveaway! 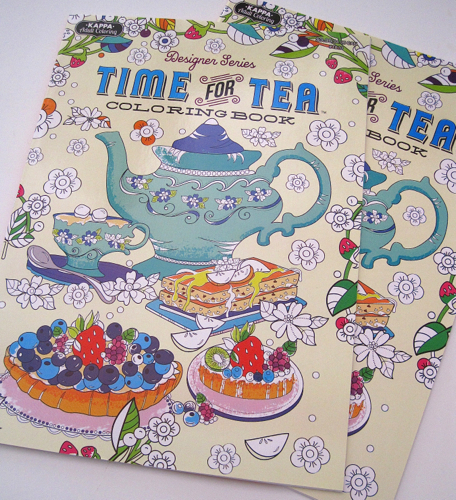 Friends, I have two more of these "Time for Tea" coloring books from Dollar Tree to give away, so I thought I'd make this a weekend giveaway and give everyone until Monday at 7 a.m. to enter. 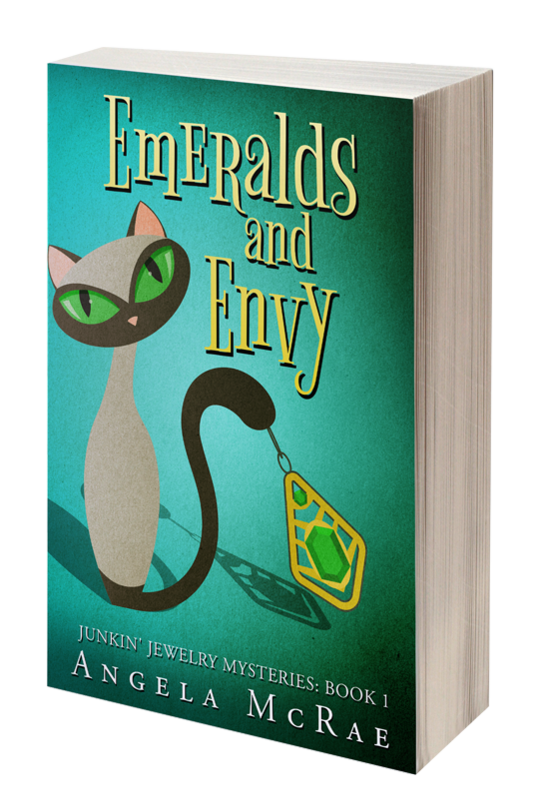 If you'd like to be in the giveaway, just leave an "Enter me" to this post before August 22 at 7 a.m. EST and you'll be entered to win. US and Canada only, please. Good luck! 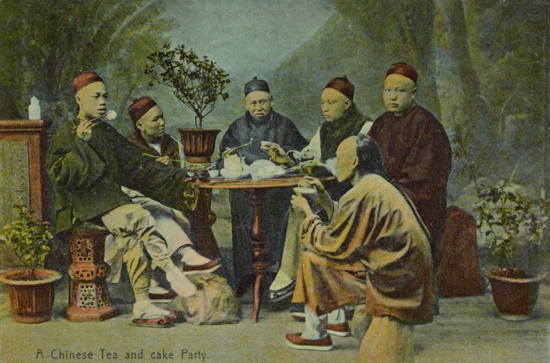 One of the tea-themed images I recently found on the New York Public Library website was this 1908 postcard titled "A Chinese Tea and cake Party." Do you find it interesting that the tea party attendees are all men? I do. It's not surprising that Chinese men are drinking tea, but it is surprising that this is called a "tea and cake party" and it's attended by men. I think it's highly possible the men wouldn't have labeled their gathering in this way! I always like to find that one person in a photo who looks like he wishes the photographer would go away, and that's pretty clearly the gentleman at far right. 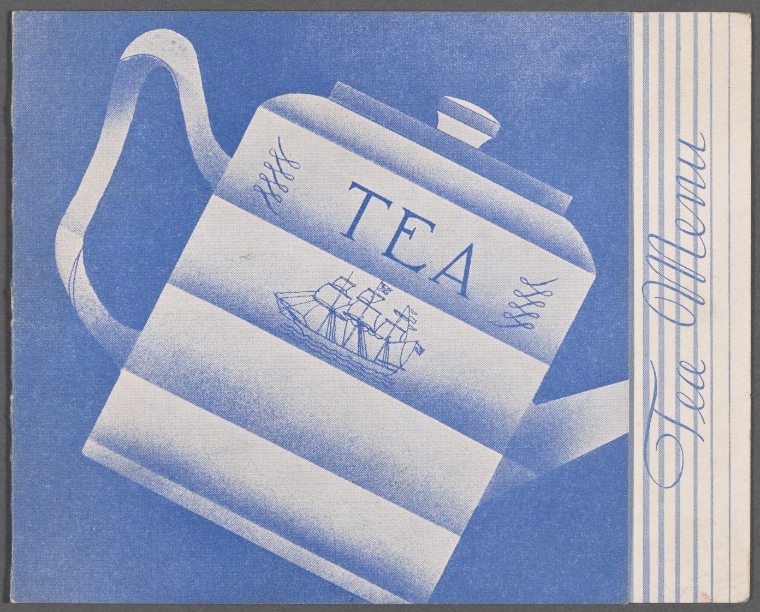 If you ever have a hankering to look for old tea images like this, by the way, the website is here, and it's well worth browsing! Last Thursday, I was getting ready to go to a business function when I got word that the new Peachtree City T.J. Maxx & HomeGoods store (a two-in-one sort of store) was celebrating its Grand Opening that day. I was torn (do I skip the event or head to Peachtree City? ), but duty won the day and I headed to my event. The next morning I had another meeting, but as soon as it was over, I headed my little Ford Focus to Peachtree City and was stunned to discover the entire parking lot of the new shopping center was full! Didn't those women (and yeah, it was 110 percent women) know that these were *my* stores? How dare they! At any rate, I had to make it for the opening weekend, and after a parking space finally opened up, I did some leisurely shopping and left with a new notebook (not tea-themed, but writers can never have enough notebooks) as well as some new teapot spreaders and a new tea mug. They had very few teacups, which was a surprise, but they had a great selection of tea mugs, including a cute one with teapots on it, but I resisted. 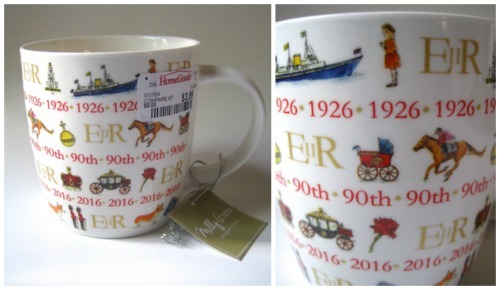 Then, I got to the very-long-but-very-efficient checkout line, and that's where I spotted this Milly Green mug in honor of Queen Elizabeth's 90th birthday. I'm trying to downsize my china a bit and had told myself, "Self, no more tea mugs!" but a $3.99 royal commemorative? So, yeah. Had to. 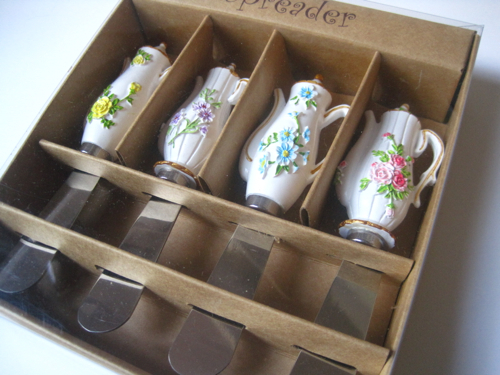 And have you ever seen prettier spreaders in your life? I had not. These were $7.99 (less than $2 each! 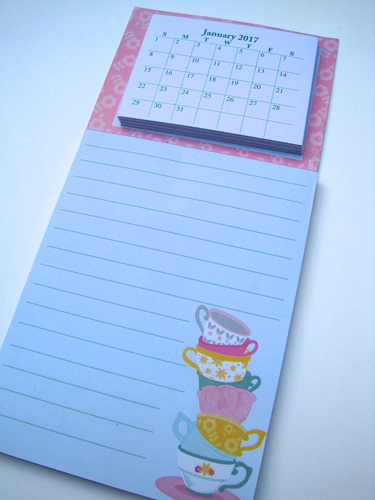 ), and I have some tea events planned soon where these will come in handy. Not a bad beginning to the new T.J. Maxx and HomeGoods store, which is located 8 miles from my house. And yes, I clocked it. Wouldn't you? When I was at Plumyumi Day Spa last week, I was intrigued by the name of one tea in particular, the Sour Apple Martini blend. It's rather ironic since I'm a teetotaler (or tea-totaler, as I like to say), but I have always love-love-loved sour apple anything! When I commented that I was interested in this tea, the owner of the spa offered to brew me a cup on the spot, and I took him up on it. It was a wise move on his part, because after just one cup, I bought the largest tin they had before I left! Are you a fan of sour apple flavor? I remember fondly the sour apple Jolly Ranchers of my youth, and I also recall a sour apple chewing gum that I don't see around anymore. 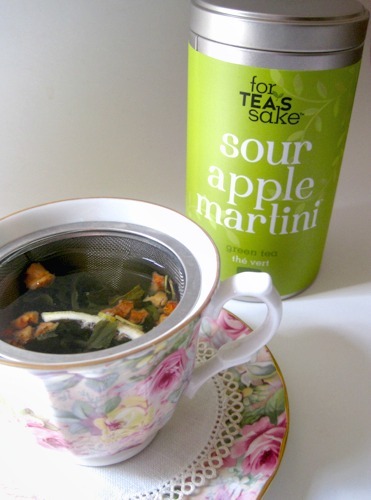 A good grown-up replacement is this Sour Apple Martini green tea, which contains green tea, apple and lemon pieces, safflower and sunflower petals, and natural flavors. 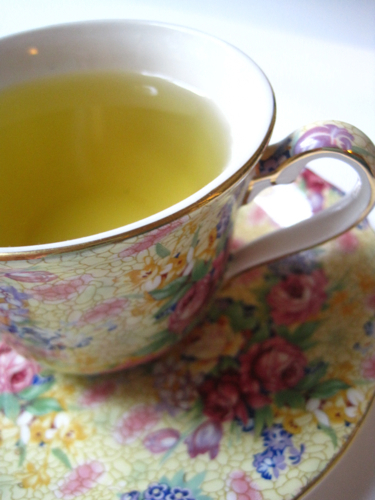 Somehow, they managed to subtly capture that "sour" taste in the tea, and I just love it! I steeped the tea in a filter basket in my teacup, and I enjoyed seeing the bits of fruit and the tea leaves spring to life. While this tea is one of those I'm now fortunate to be able to purchase locally, if you don't live nearby, you can visit the For Tea's Sake website and check it out for yourself! 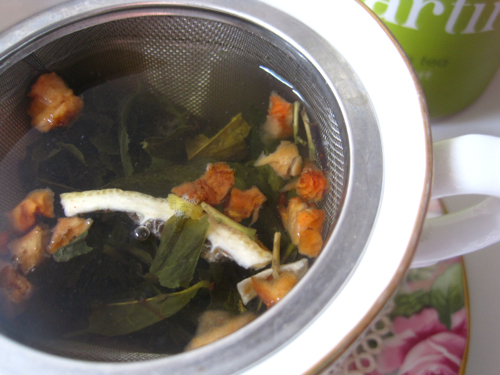 Plumyumi Day Spa now offering loose leaf teas! 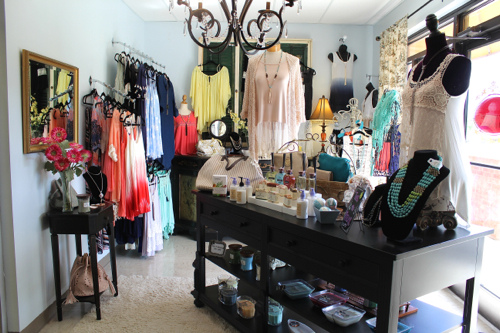 Have I ever written about a day spa on this blog before? I don't think so, so today may be a first! 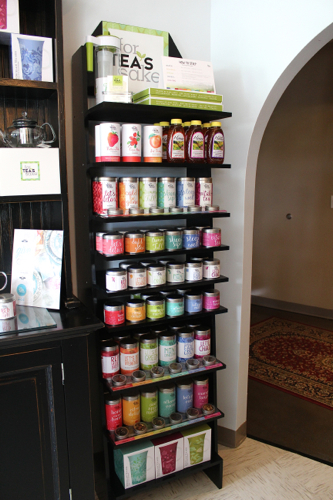 A few months ago, Eddy Logan, the owner of Plumyumi Day Spa in Peachtree City, contacted me in search of some tea advice. His wife had discovered my tea blog, and since they were considering offering specialty teas at their spa, he asked if I would mind meeting with him and sharing my thoughts. I've never been asked to talk about tea to anyone in the spa business, but Eddy seemed genuinely interested in tea and the process of properly preparing and serving it, so I was happy to meet with him. 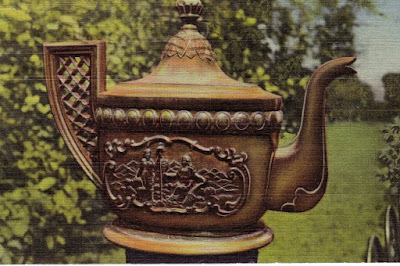 He asked about varieties of tea, presentation of the tea, storing the tea, steeping the tea, the electric kettle for boiling water for the tea, the best implements for infusing and filtering the tea … all the things that let me know he had done his homework! The line chosen to launch the new tea experience at Plumyumi is called For Tea's Sake, and the ones I've sampled so far have been absolutely delicious. The staff has obviously mastered the art of brewing them perfectly. Last week, I tried the Red Velvet Party, a wonderfully rich and truly velvety rooibos; Skinny Sip, a terrific oolong and green tea with a subtle smoky hint; and a third tea that I'll tell you about tomorrow because I brought a tin of it home with me! 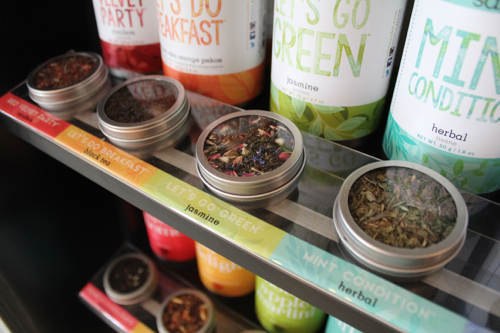 I love the variety of teas, the colorful packaging, and the fact that samples are available for sniffing. Also, the price point ($12.95 for the large, nearly-3-ounce tin) is a very good value today. I think Plumyumi is very wise to have decided they will welcome anyone to stop by and have a free cup of tea anytime! 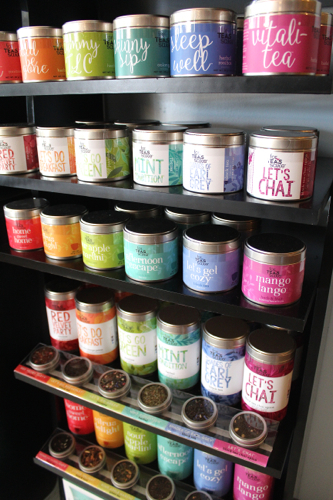 To begin with, they'll be offering three different varieties each day, and they're happy to serve you while you browse the teas and the rest of the boutique area. 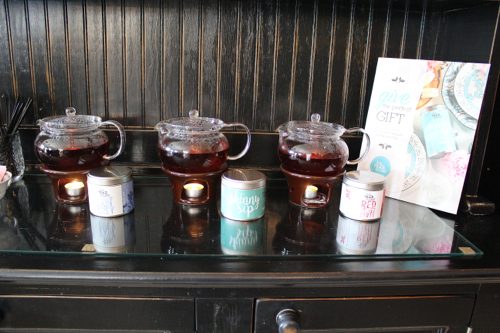 Their tea gifts alone are impressive: glass teapots, tea sample sets, mugs, infuser travel mugs, tea filters, infusers, flavored honeys and more. 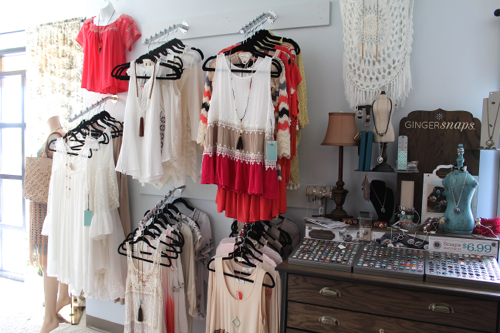 On a side note, I was delighted to see they have Ginger Snaps, that line of interchangeable jeweled pieces that pop in and out of bracelets, necklaces and other jewelry. I love mine, and I love knowing I now have another place to buy them. I was also asked if I'd be interested in perhaps coming one evening this fall to speak to customers about tea and have a tea tasting, so I may have even more Plumyumi news to report in the weeks ahead. 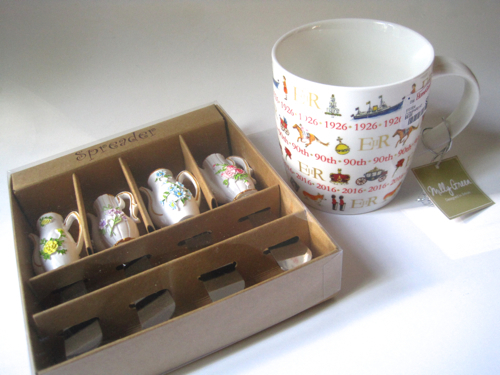 But mostly, I'm just thrilled that I've learned about a great new resource for quality tea and tea gifts. 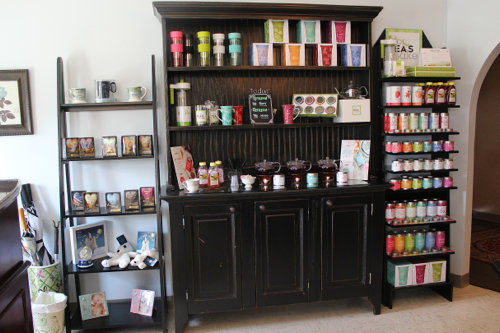 If you're near the spa (click here for the website), stop by for a cup of tea and tell them Angela sent you! 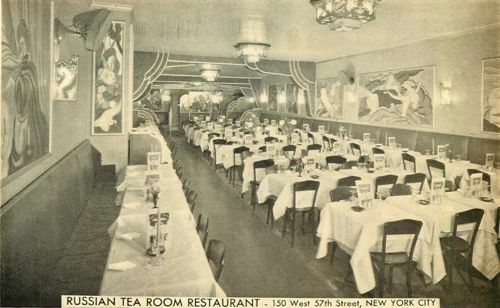 I was not at all surprised to find lots of information about tea in New York, and I especially had fun discovering a few of the more obscure things about the Empire State! • Tea Island on Lake George, New York, is a historic resort area that once had a tea house on it. 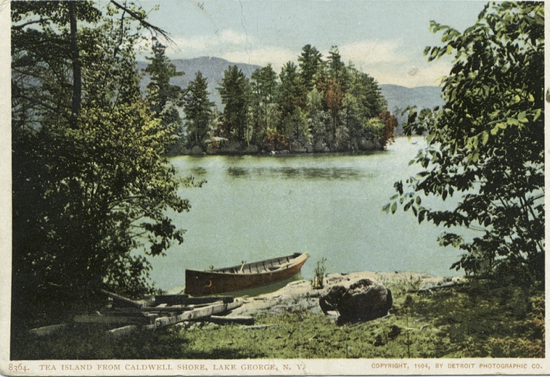 According to the 1868 book "Lake George" by B. F. DeCosta, "Two miles down the lake, on the west side, close to the shore, is the first island which we pass. It is called Tea Island, and is a perfect gem. In 1828 a 'Tea-house' was kept there to accommodate visitors, which fact accounts for its present name." And you can still visit Tea Island today! Click here if you'd like to see its modern incarnation. • Some "society women" of a hundred years ago poured tea in New York City for the "motor men of Street Railway." This is one of those wonderful old Library of Congress images that raises more questions than it answers. 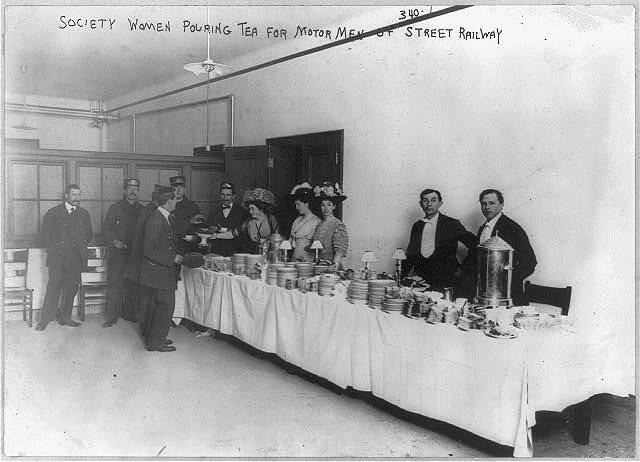 Its title is simply what the photo reads up top, "Society women pouring tea for motormen of Street Railway." 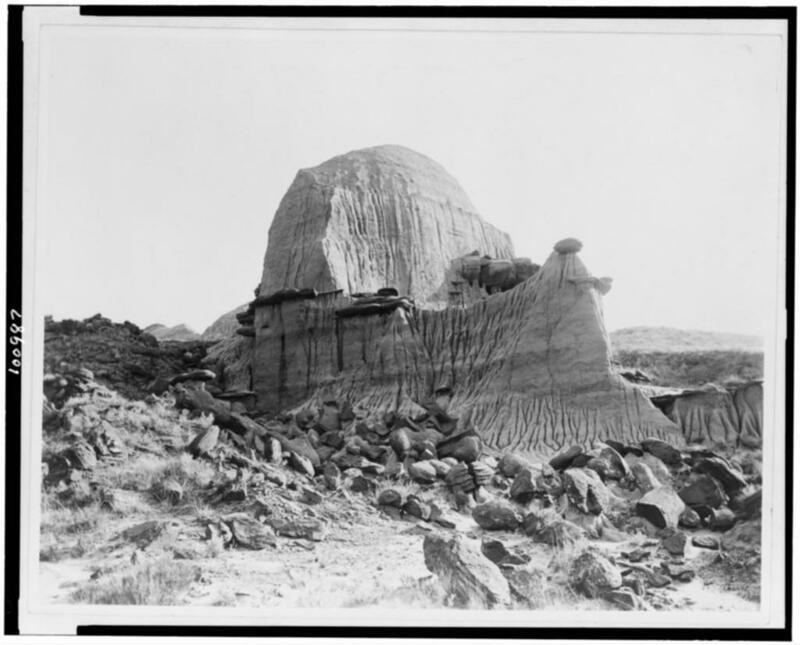 The photo, which is from around 1908, is part of the George Grantham Bain Collection. Who was Bain? He was a New York City photographer known as "the father of foreign photographic news." I can't help wondering whether Bain took this photo himself (those two men at right and that "society woman" closest to them look a bit, um, unimpressed, shall we say). "Motor man" appears to be a term for those who conducted trains and trolleys. So that's helpful, I guess, but why were the "society women" pouring tea for them? Motormen Appreciation Week, maybe? And did you notice the little candlestick lamps/lights on the table? Interesting. 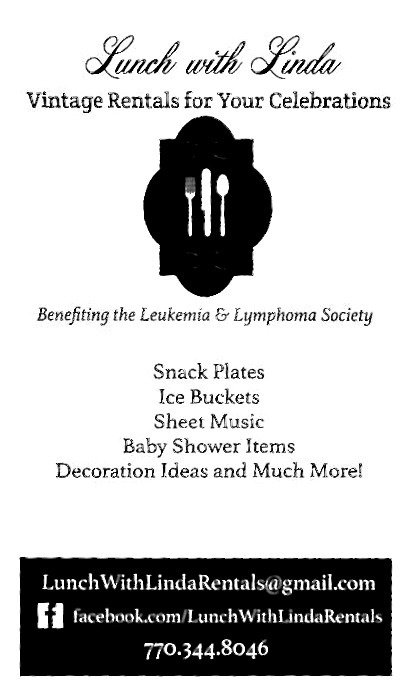 And isn't it funny that a century may pass, but we still need the basics of white tablecloths and stacks of plates and cups and a nice, big tea urn! • New York City is home of the Russian Tea Room, which is perhaps one of the most legendary tea rooms in the country. 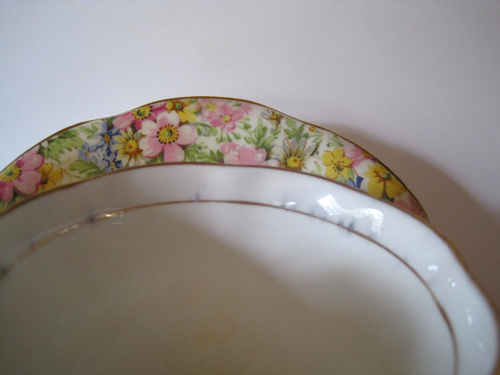 A new teacup and a new look!